Do you suffer from any of these sypmtoms? If so, you my benefit from a detox periodically. Although the human body is designed to cleanse itself naturally of the normal waste by-products of digestion and metabolism, it is not able to deal with the additional toxic overload from chemical preservatives, pesticides, pharmaceutical drugs, cigarettes, processed foods, food additives, cosmetics, cleaning products, car exhaust fumes, and other sources of external toxins present in the air, water and food that we consume. Toxins can also be generated internally by “unfriendly” bacteria, yeasts and parasites in our digestive systems which are absorbed into the bloodstream, affecting our health and vitality. Purification of polluted blood and tissues is absolutely necessary to preserve health and prolong life. A periodic detox is probably the single most effective preventative measure you can take to prevent disease, cancer and degenerative conditions that thrive in an acidic, poorly-oxygenated body. Detoxification is also the best cure for most of the above conditions, so its’ importance cannot be emphasized enough. When detoxifying your body it is important that all the key detoxification organs and systems within the body are cleansed otherwise toxins can re-enter the bloodstream and cause unpleasant symptoms. This includes the bowels, liver, kidneys, lymph, skin and lungs. Excessive levels of toxicity and acidity in the body suppress immunity, interfere with normal metabolism, inhibit digestion and absorption of nutrients, and promote fungal and bacterial infections. There are many different detox programs available these days which can be a bit confusing and overwhelming. An experienced Naturopath will be able to advise you on the best program suited to your individual needs and requirements along with a specific diet plan which will ensure you are eating the right foods for your body to maximise the detoxification process. Below are some simple diet changes you can make today to reduce your level of toxicity and help your body detoxify naturally. * Always look for fresh organic seasonal fruit and vegetables. * Avoid processed, packaged foods as much as possible. * Eliminate foods containing artificial colours, flavours, additives, flavour enhancers, preservatives and hydrogenated fats. * Read the ingredients list to make sure the food doesn’t contain high amounts of saturated fats, gluten, or sugar. 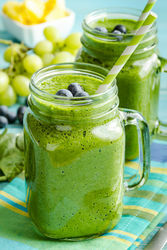 * Try to eat as many green leafy veggies as possible which are great for alkalising the blood and tissues. Garlic, ginger and onions also have potent cleansing properties. * Cook your veges only by steaming, stewing, or stir-frying to retain their nutrients and enzymes-no frying, microwaving, pickled, tinned or frozen foods. * Eat plenty of citrus fruits, apples, pears, watermelon, cherries, berries, papaya and black grapes which are the best internal cleansers for the body. * Reduce or eliminate meat. Any meat consumed must be organic and cooked only by grilling, steaming, stir frying, or poaching-absolutely no fried or barbequed meats. * Eat more fresh fish, legumes, pulses, beans and vegetarian meals which are more alkalising in the body. * Reduce or eliminate dairy-substitute with alternatives such as organic, non-GMO soy, rice, tofu, coconut or nut milks, butters, yoghurts or cheeses. * Reduce grains as they are acid-forming and require a lot of enzymes to digest. * Choose millet, spelt, barley, rye, buckwheat, kamut, amaranth or brown rice instead of wheat products which are very acidic and can cause many allergic reactions. * Eat only whole, organically grown grains and strictly avoid all white flour products such as bread, pasta, crackers, and pastry. Sprouted grains are fine as they become complete living foods full of essential nutrients and enzymes and alkalising once sprouted. * Eat more raw, unsalted nuts and seeds which are excellent sources of vegetable protein, essential fatty acids, vitamins and minerals but make sure you soak them overnight to make them easier to digest and help release their nutrients. * Only use organic cold pressed oils such as flaxseed, avocado, walnut, almond, macadamia, and coconut oils. Avoid smoking cigarettes, taking any recreational drugs, and limit alcohol consumption as they are highly toxic on the body and put extra strain on the liver and kidneys. * Avoid carbonated drinks and reduce caffeine as much as possible, except for green tea which contains many antioxidants and helps boost metabolism. * Drink plenty of pure water, fresh raw veggie or fruit juices, herbal teas and clear broths which all help to flush out toxins and alkalise the blood and body tissues.